LET US NOT FORGET: PATRICE LUMUMBA WAS MURDERED EXACTLY 50 YEARS AGO! A key ally of Ivory Coast’s disputed leader Laurent Gbagbo has resigned as head of the Central Bank of West African States amid regional pressure. Governor Philippe Henri Dacoury-Tabley, an Ivorian, quit after a bank meeting on Saturday. The bank said he had failed to implement an order to no longer accept Mr Gbagbo’s signature for funds. The internationally recognised new president Alassane Ouattara has been asked to designate a new bank chief. Mr Ouattara says Mr Gbagbo has withdrawn hundreds of millions of dollars from the bank since the disputed November presidential election. Mr Gbagbo has refused to step down as president. Late on Saturday Gbagbo said he rejected the resignation of Mr Dacoury-Tabley. The Central Bank of West African States groups the treasuries of eight West African countries. The European Union had said it would impose sanctions on Mr Dacoury-Tabley, making his position untenable. 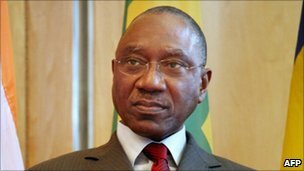 According to a declaration of heads of state from West Africa’s single-currency zone after an emergency meeting in Mali: “The conference is concerned about the impact of the non-application of the decision [on Mr Gbagbo] on the stability of the economic, financial and monetary system of the union. Mr Dacoury-Tabley blamed “technical reasons” for not applying the measure. Ouattara ally Patrick Achi told Reuters news agency the resignation had been “what we have been calling for”. UN peacekeepers are protecting Mr Ouattara in his temporary headquarters at a hotel in the main city of Abidjan. Separately on Saturday, Mr Gbagbo said he had cancelled the accreditation of the French ambassador. He was responding to a move by Paris to accredit Ali Coulibaly, Mr Ouattara’s pick as Ivory Coast’s envoy to France. France said the removal of its envoy’s accreditation was “devoid of any legal standing”. The presidential election in November was supposed to reunify Ivory Coast, divided since a 2002 civil war. The country’s electoral commission said Mr Ouattara had won – a position backed by the UN mission in Ivory Coast, which helped organise the poll. But Mr Gbagbo’s supporters said that the New Forces rebels who control the north had rigged the poll in favour of Mr Ouattara. The Constitutional Council, headed by an ally of Mr Gbagbo, then annulled votes in these areas and declared Mr Gbagbo the winner.